A key element of the EU’s free trade and preferential trade agreements is the extent to which they deliver improved market access and so contribute to the EUs foreign policy objectives towards developing countries and neighbouring countries in Europe, including the countries of the Balkans. 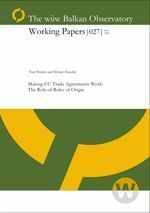 Previous preferential trade schemes have been ineffective in delivering improved access to the EU market. The main reason for this is probably the very restrictive rules of origin that the EU imposes, coupled with the costs of proving consistency with these rules. If the EU wants the ‘Everything but Arms’ agreement and free trade agreements with countries in the Balkans to generate substantial improvements in access to the EU market for products from these countries then it will have to reconsider the current rules of origin and implement less restrictive rules backed upon by a careful safeguards policy.